Well, one of my first forum threads on what I’m planning to do with my 1000mm xcarve. The plan as of now, is to get a sturdier workbench, as the desk it’s sitting on right now isn’t cutting it (bah dum tsh! ), and I’m thinking it’s hurting some of my carves. 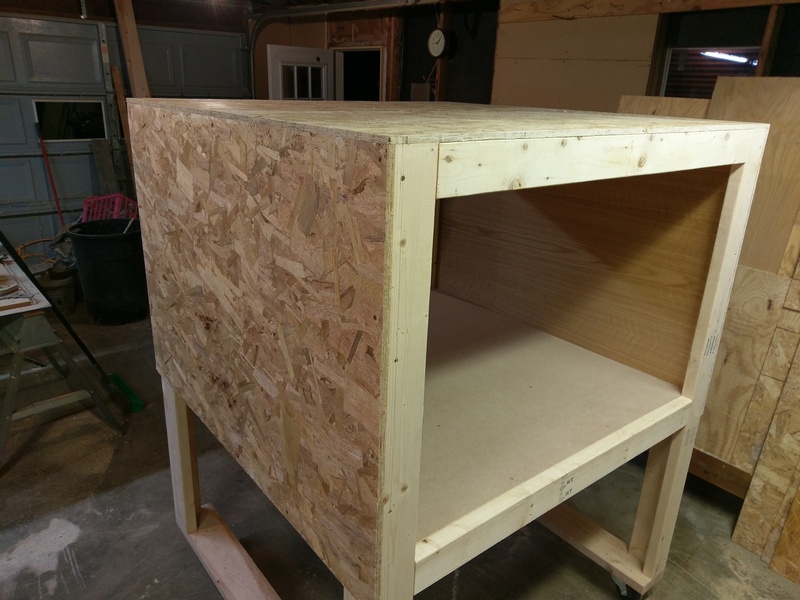 My plan is to build an entirely new workbench for my shop, which is located in my basement, which I’ll have 14’x24’ to work with (with a water heater and furnace in there, along with all of my other tools, wood, everything). Saving space for me is key. What I’m thinking of doing is building a 3 level workbench, on casters so I can move it as needed. Bottom will be where the X-Carve goes. Middle will be a smaller (possibly only 6-8in tall), to store laptop, x-controller, bits, clamps, etc. Top is just your standard workbench, open to the room. At this point, I have one question for those that have built enclosures…What height would you recommend from floor to ceiling for the bottom level where the xcarve goes? I want to keep the height to a minmum, but I also don’t want to be crawling in the cabinet that’s too small. 2.5 feet? 3 feet? 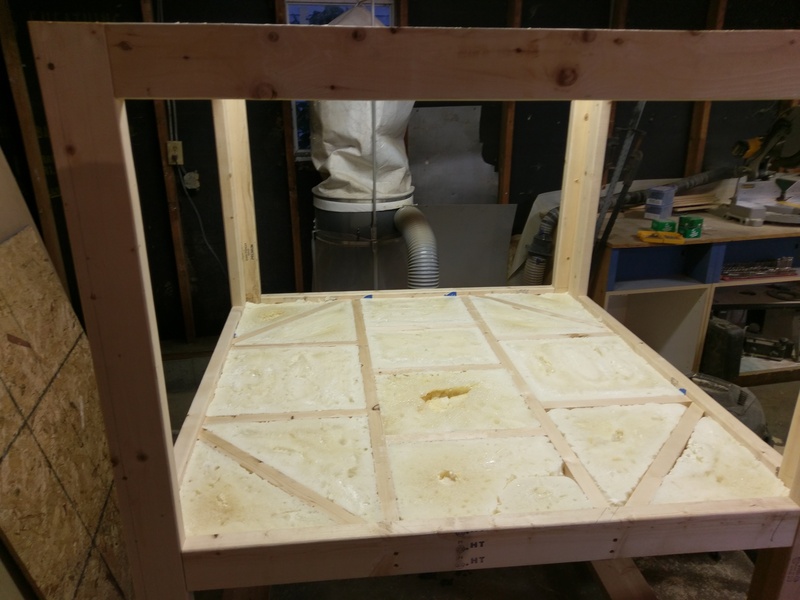 I built my enclosure for a 1000mm xcarve with 30 inches of clearance from the surface the frame sets on to the enclosure ceiling. I chose this height to have clearance for LED strip lighting, a 4" dust collection hose on a swing arm, an 8" linear z axis, and room for up to 4" of additional lift. Right now I have Charlie’s lift plates installed, and have not yet needed the additional 2" of lift. I did forget to consider the additional height from adding a larger stepper motor on top of the linear z-axis. Personally it still feels a bit tight with everything in there. I wish I would have went ahead with 36" of clearance. Also, plan on placing another access hatch at the back of the enclosure. It helps quite a bit for adjusting belts and just accessing the space for upgrades. I have added two bays below with a pull-out work table and two stacks of drawers to hold my accessories and a custom controller. 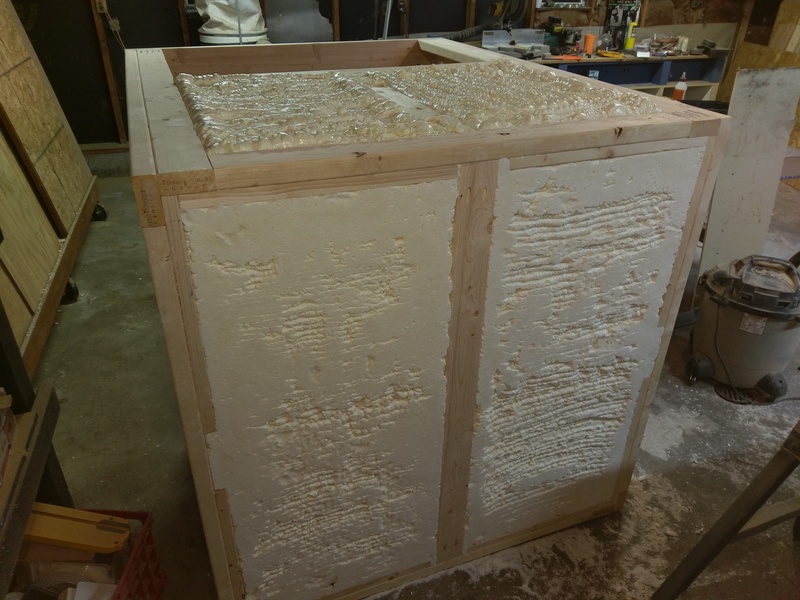 The floor, ceiling and wall cavities are 1 1/2" and filled drywall and closed cell foam. This does significantly cut down the noise of the xcarve itself. However at this point it is moot since the Harbor Freight dust collector runs right next to it. I have some ideas on what I want to do to isolate the dust collector, mainly placing it outside. 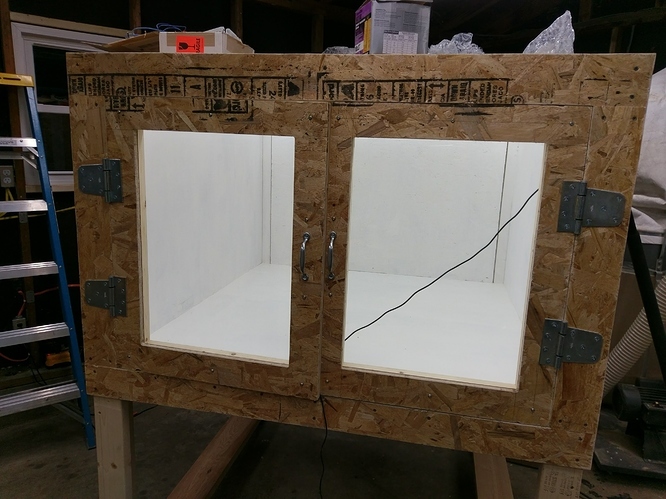 However, the shop is in the process of being insulated and fully heated/cooled, so I don’t want to dump my nice conditioned air outside when the xcarve is running. I’ll probably end up pass the vac intake out to the collector, the the exhaust back in then through a filter stack. That’s a lot of work to avoid having to wear hearing PPE. That looks awesome! Have you seen mine? Same type of thing, mine was more focused around sound, but mine is also 10x larger.